It's Lulu's birthday. Help her make biscuits, blow up balloons and get ready for her party. Happy Birthday Lulu! 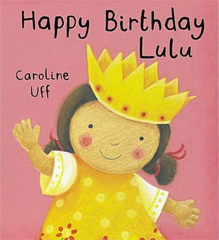 Happy Birthday Lulu by Caroline Uff is a picture book with lovely images of Lulu celebrating her birthday with her family and friends. It's a great first book for young children to see other mixed-race families doing everyday things. Happy Birthday Lulu is available at bookshops to buy now.